The 2014 Sonic is amazingly better than any subcompact needs to be. It delivers great gas mileage and has an easily-affordable price, both of which are expected. What's not expected is the great driving experience of over-the-road comfort and around-the-corners handling. 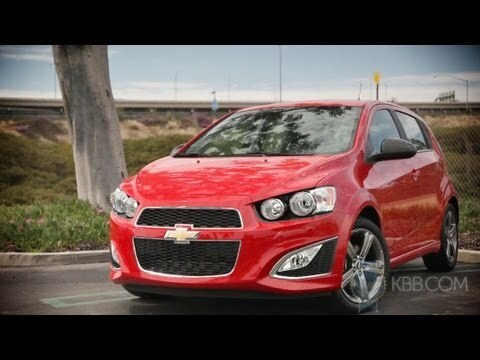 The Chevy sonic, all that is included in this nice smaller car. Nice smaller car. drives very smoothly. Has as much room as some small SUVs. This has been a very dependable vehicle for my whole family. My husband has a truck so when we go somewhere ad a family we generally take my car. My car had almost 70, 000 miles on it and I have had very few repairs. When I purchased the car new I received my car with a nice warranty. Has a nice stereo system that my kids enjoy also. I have had my vehicle for about 4 years and have been very pleased. I am a Chevy fan and have owned several Chevy vehicles. The Chevy sonic is a nice affordable vehicle that is a nice size for about 4 people. I would consider it small to mid size. I go lots of places and have had good luck with my car. It had always been dependable and that is important to me because I haul kids and kids friends all over the place like so many parent do. I like the interior of the vehicle also. It is easy to clean and looks very modern. The seats are very comfortable as well. It has armrests that. You can use or set up if you would prefer not using them. I really do not have any complaints with this vehicle. The vehicle also has nice trunk space. Probably the only thing that I wish my. Car had would be a CD player and that is just because I am one of the very few that still like to listen to CDs. I get great gas mileage which is great for how much I am on the run all of the time. That was one of the main reasons I chose a car over an SUV. With current gas prices I normally full my tank for about 25 dollars and it usually lasts me about a week depending on how much I am driving. I have been very happy with my vehicle and if you are a small to midsize car Person then a Chevy sonic is a great. Choice. Great starter car, not great for a growing family. I picked the car from the lot based on the lights. Per the salesman, fog lights meant loaded features. I was going for the cheapest option and a color I enjoyed. I needed a car and fast. This meant I ended up with no power windows--a choice I regret very often. No cruise control either. Growing up with both, I was mistaken in thinking these are features automatically included in any vehicle. Now that I have a child, the size of the interior is not the greatest for hauling a child and adult passenger. Not much room for a car seat with a comfortable adult in the front. Handles well in all weather conditions. Reliable warning lights for oil, low gas, etc. Perfect car for college and individual person! Great car. I bought it used, but I have done regular routine maintenance on it. Has not let me down yet. Drives beautifully. I have the ability to start the car remotely with the key which is great on cold mornings. The heater is already blowing warm air when I get in. Handles very nicely, and has a lot of room in the back seat. My trunk is spacious. The Bluetooth works great. People tell me there is a light whistling noise, but I do not know if that is the car or their phone. Sound system is really nice for stock system. GM will notify owners, and dealers will test the terminals in the IP harness clock spring coil connector and replace any loose terminals, free of charge. The manufacturer has not yet provided a notification schedule. Owners may contact Chevrolet customer service at 1-800-222-1020. GM's number for this recall is 14537.